PADI is the world's largest diver training organization and offers the best Instructor training programs available. The heart of the PADI instructor training is the Instructor Development Course (IDC). The Instructor Development Course is a 9 days course program and provides a professional learning experience in which you will learn how to teach diving, utilising the most successful program in existence - the PADI system of diver education. The IDC has to be run by a PADI Course Director and his staff in a PADI 5* IDC or a PADI 5* Career Development Center (CDC). When you complete the PADI IDC, you will have been trained and prepared to attend a PADI Instructor Examination (IE), the final step towards your PADI Open Water Scuba Instructor certification. An Instructor Development Course consists of two sub courses – the Assistant Instructor program and the Open Water Scuba Instructor program - which are completed in one go. Instructor Development Courses are standardized programs, following a strict curriculum. Because of that, theoretically the IDC should be the same quality all over the world, no matter where it`s done. Unfortunately this is not true! There are big differences in quality. Most IDC prepare candidates only to pass the instructor exam. They do not prepare for real life teaching. Happy Divers Marbella & IDC College has a different approach. Our Instructor Development Courses prepare instructors in the first place for the “life after the IDC” and in the second place to pass the instructor exam. Important is, to come well prepared to your IDC. Divemaster related knowledge and skills (divemaster exam and the 20 skills) have to be up to date. They are not taught during the IDC, since they are part of your divemaster training, which you have done before. 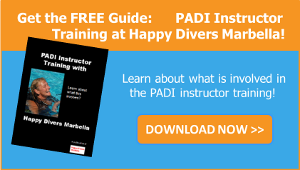 Instructor Development Courses and Instructor Examination (IDC & IE) take place in April/ May and November at Happy Divers Marbella & IDC College`s premises. Instructor continuous education programs are run right afterwards the IE.